We took a family hike on the Fourth. We didn't want a long hike, because we wanted to catch the Paul Olson bash in the evening. Hurricane Ridge is a bit of a drive, but it puts you in the high country before you even start hiking. We enjoyed a leisurely walk up to Hurricane Hill (about 3 miles round trip) Conditions were fantastic and the views were great. The Ridge was packed with tourists, every other party was speaking a different language. It always amazes me how many out of state tourists visit Olympic National Park. I am told that it is in the top five national parks in the country for annual visitors. The Olson party in the evening had an added musical dimension as there was a continuous concert all afternoon and evening. 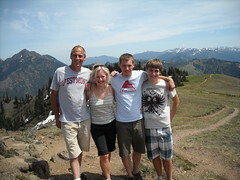 I love Hurricane Ridge and ONP. What an amazing place! I want to get out to see the wildflowers this year in the high country.